﻿ Cirneco dell etna. Cyrenensis Nora. Slovenia. Is it possible to describe Nora in a few words? It is not. Beyond her elegant, dignified appearance lies a soul capable of unconditional love, extraordinary speed and endless happiness. 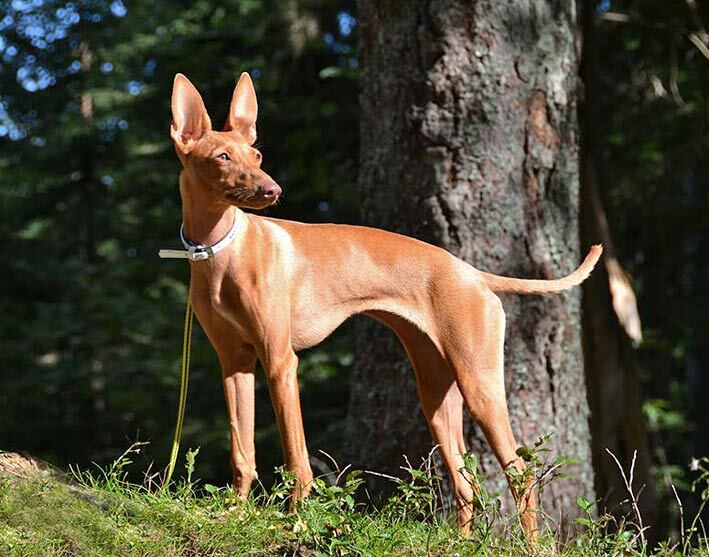 She is a lovely cirneco dell etna female of smaller size, high set ears and gentle expression. She is highly interested in the world around her and follows the smallest move, the faintest sound, leading you through unknown paths. She has tender character that charms children and she never shows any signs of disapproval towards other dogs or people. Nora lives with two other dogs and will never discuss her position in their »hierarchy«. With the ability to be submissive and proud, calm and energetic, she is a wonderful dog, adaptable to many different situations. She is happy to contact people or animals, travel around to different places where she can satisfy her infinite curiosity. Still, there is an ancient creature living inside her, making her even more special – she lives according to her instincts and, though she loves her family very much, is very independent. Living with her makes you wonder what will she reveal about herself in the next moment. I am very grateful to be able to hold a piece of this ancient treasure in my heart.